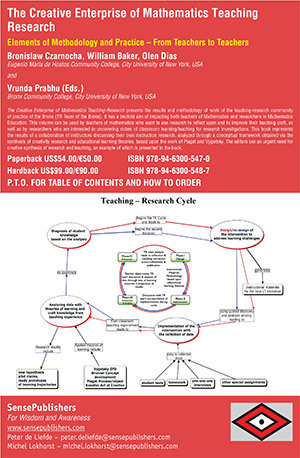 The current volume, VOL 10 no 3-4, of the Mathematics Teaching Research Journal contains a variety of topics that can serve as an inspiration for possible directions of own research in the classroom. All themes are well known and well established in a broad literature but bringing them to a particular locality of own college and own classroom, always gives them a new flavor. The reader will find an Inquiry Based Learning (IBL) technique, a report from using RStudio in a statistics class, an analysis of procedural understanding, a book review, and descriptions of techniques used in calculus classes. The first one is related to the creative thinking and cognitive interest, and the second describes grading individual students in a team. The volume begins with an article by Jae Ki Lee from BMCC about using Inquiry Based Learning while teaching complex numbers. The author describes his class experiment where students find ways of computing the powers of the imaginary number i and comparing answers with each other to assess their results. In the conclusion it is stated that IBL encouraged students’ curiosity and enhanced their learning experience. As the author pointed out students were eager to share their findings with each other and reacted with enthusiasm to the assignment. This attitude is rarely observed during traditional lecture-style teaching. The second article, by Nkechi Agwu and Piotr Bialas from BMCC, calls for using a free software R or RStudio as a calculator in an Introductory Statistics class. Learning objectives contain producing and interpreting summary statistics, graphing and analyzing a scatterplot including the regression line, creating various graphs such as histograms and bar plots, and creating multiple graphs in multiple frames for comparison. The authors performed their work in five sessions assessing creativity and learning outcomes. Each session is presented in the article and contains all details to adopt it in another classroom. The authors indicated in the introduction that the learned RStudio during a two half-day session at the International Conference on Teaching Statistics and were convinced about usefulness of the software. Jair Aguilar and James A. Telese from the University of Texas, Rio Grande Valley present their work related to pre-service teachers who go through assignments and are graded based on three types of competencies: procedural fluency, conceptual understanding, and problem solving. The rubric is provided to describe five levels of each competency. The authors analyze statistical data obtained during the experiment and draw conclusions about the self-faith gained by students who participated in the experiment. Problems solved by their students sound comical, for example: “The people of Freckleham are interesting creatures. Every Frecklehammer is different from the other and has at least one freckle and one hair but no more than three freckles and three hairs. Make a list of all of the different Frecklehammers …,” but they are basic combinatorial problems. “The Outer Limits of Reason” by Noson Yanofsky is reviewed by Malgorzata Marciniak as an instance of a textbook written by CUNY faculty for use in the classroom. The book offers engaging and stimulating discussions suitable for mathematicians, computer scientists, philosophers, and anybody interested in philosophy of science. The discussion contains numerous classical topics such as mind games, paradoxes or computing complexities, but takes them into another level by offering a deep and insightful analysis of what is possible and what is impossible within them. The book is highly recommended for readers who enjoy engaging their thoughts in philosophical considerations about science or mathematics. Creative thinking is a theme of the article by Miriam Dagan, Pavel Satianov, and Mina Teicher from Israel. The authors present their teaching techniques applied in calculus classes taught for engineers. As a motivation for their work they provide an argument that in the age of technology computational math skills can be performed by machines which will never be programmed to solve new problems. That is why students need to be trained to grow cognitive skills to perform this task. One of the most fascinating aspects of this article presents, with images, how to use an electric tape (or any other tape) to explain the idea of measuring angles in radians. The article by Jeff Ford about team-based learning presents a solution for a dilemma we often face while grading team-based work. Here the author applies an iterative process of adjustments to a method found in the literature. The most intriguing part of this article is about introducing peer review reports among students and including the results as a factor in a course grade. Since students work with each other on daily basis, they keep record of attendance for each other and accept or reject each other’s excuses for absences. An ample set of sample documents is contained in the appendices to illustrate the work beyond the idea. ©2007-2019 Mathematics Teaching-Research Journal (MTRJ). All rights reserved.